Hostess went back to the drawing board to come up with a "new and improved" version of Suzy Q's snack cakes that feature 50 percent more creme and 50 percent more cake than the previous version. 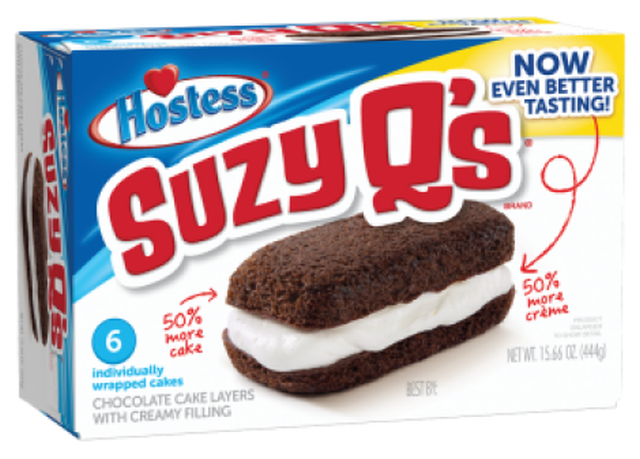 The brand brought back Suzy Q's in 2016 but due to consumer feedback came up with this new version that is meant to be more true in both taste and appearance to the original dessert that was introduced in 1961. Beyond the increase in chocolate cake and creme, the new Suzy Q's sport the round edges of the original. With the larger size, Suzy Q's now come in 15.66-oz six-count boxes (compared to 12.13-oz eight-count boxes previously) and can also be found in twin packs.